Mustang Remote Start Scares Girls And It’s Ridiculous! Mustang Remote Start Scares This Girl! The major increase in the various car model production has been absolutely massive in the past couple of years and brand-new cars are produced each day. This means that the market has to offer something for even the pickiest of a buyer. You can get a car with some absolutely incredible features; features that you would have never even think off to find in a car. 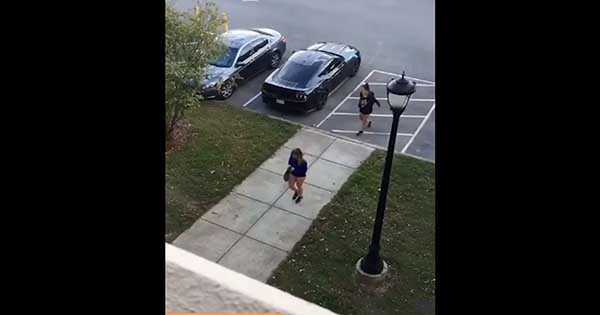 Hereby, we take a look at this video and we see the girl`s hilarious reaction to this Mustang remote start. The video went viral soon after it was published. Namely, we see couple of guys having fun with their brand-new car and are filming the people`s reactions from their flat above. The Mustang is parked just in front at the parking lot and everything was nice and ready for some fun. Namely, two girls are seen approaching the car and the guys throw themselves into action. They honk the horn and flash the lights, but that did not scare the girl at all. Namely, what followed next is what is going to make you laugh. The guys via the Mustang remote start powered up the car and roared its furious engine, something that caused the girl to get very scared. She even jumped up and began running hence she was scared that the car might run her over, even though the Mustang was not even moving. What do you think, what would your reaction be if the same had happened to you? Finally, read what actually happens when you turn your key in the ignition!